Out of its belief in the importance of the Human Asset & based on the success of the Employment Fairs organized previously,the Foundation held its 3rd Annual Employment Fair for its graduates under the auspices of the Industrial Training Council. 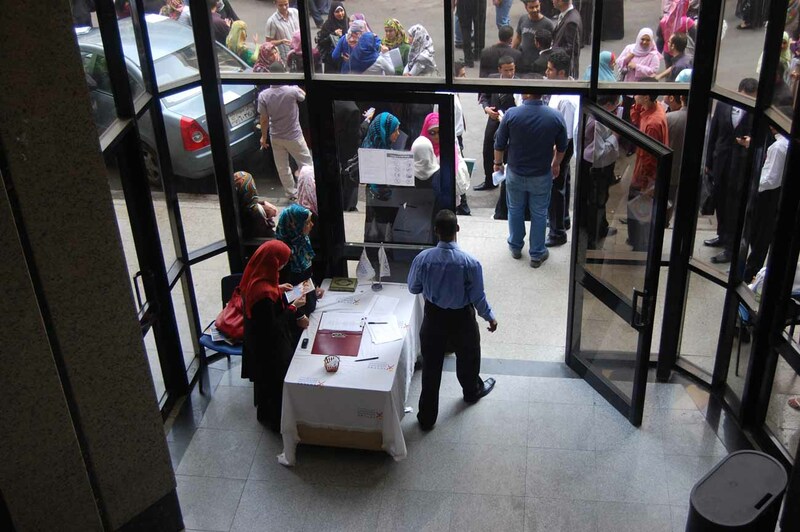 The Fair was a pleasant opportunity for more than 1000 FGF Graduates to explore the Labor Market needs, as it provided more than 1300 job opportunities inside & outside Egypt. A wide range of National & Multinational companies participated in the GRP fair, such as Americana, Aramex, Mobinil, GB Auto, Arma Group & Silicon 21. 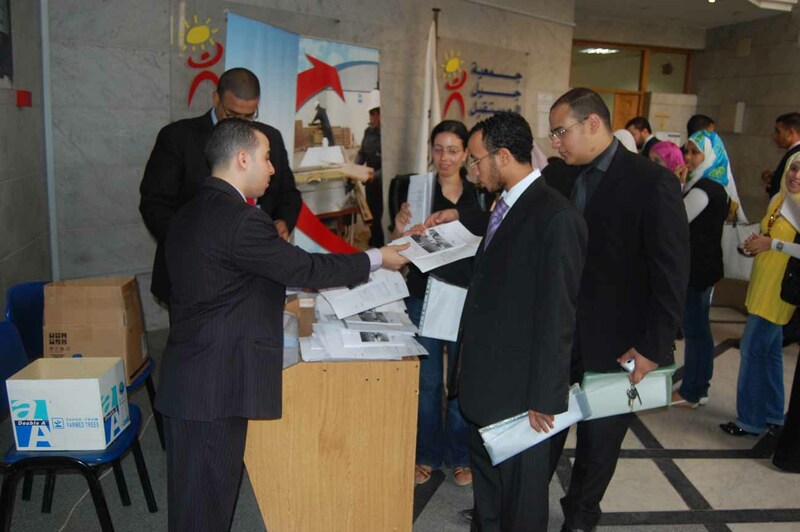 In addition to the pervious companies, various Recruitment Agencies participated in the fair such as Wazayef Masr, The Employer Magazine, Top Business and El Maaly Recruitment. Moreover the Fair witnessed the participation of new sectors that participate for the first time such as the Banking sector & the Development Sector. Through the GRP , the Foundation provides the fresh graduates with the crucial skills needed for Today’ job Market with a main focus on English language for business & IT Skills for Business in addition to a specialized track in one of the most demanded business fields specially tailored according to the industry Demand . 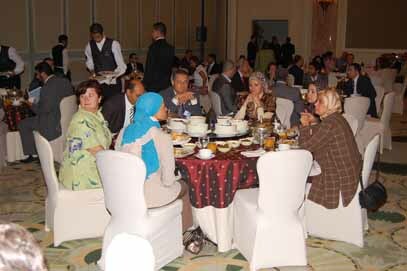 In a step to promote networking and exchange of experiences, the Foundation - Center for Executive Excellence (CEE); organized an “Iftar Gathering” for Human Resources and Training Managers from diversified sectors, aiming to endure its relationship with the business community in order to keep updated with the needs of the labor market in the Training and Skills development Field . In his Speech, Mr. Mohamed Farouk Hafeez, the Secretary General & Board member, highlighted the leading role played by the Foundation in developing Egypt’s human Capital, which came as a result of its sustained effort for the past 10 years through the initiatives and the training programs it presents which helps in increasing the effectiveness of institutions and the capacity building of individuals and leaders. He also added that the Foundation gives special attention to addressing the human resource challenges facing organizations today. Additionally it believes strongly in enhancing Education and developing the capacity of Civil Society, which along with public and private sector creates the Sustainable Development triangle. It is worth mentioning that the Center for Executive Excellence (CEE) which was established in 2004, has graduated till now more than 1500 executives in all areas. Moreover, it’s the First Center of its kind to be ISO certified as a Quality Executive Training Center in the Middle East. The Foundation celebrated the graduation of more than 4000 graduates of the Graduate Resource Program (GRP) on Sunday, June 28th, 2009, in the presence of H.E., Dr. Hany Helal, Minister of State for Higher Education & Scientific Research. This exceptional event brought together a diversity of Political and Educational leaders including Head of chambers of Industry, Industrial Modernization Center (IMC) officials, Industrial Training Council leaders & other notable public figures. The GRP is an outcome of The Foundation continuous efforts over the past ten years, which was made successful by signing a cooperation protocol with the Ministry of Trade and Industry, aiming to supply the Industrial sector with trained & qualified workforce with the highest level of efficiency to be capable to compete in a fierce competitive Job Market. Dr. Hany Helal, Minister of State for Higher Education & Scientific Research, added that the Ministry had to close specific sectors in some colleges and open other ones in accordance with the labor market requirements, pointing out that the theme of the current stage is “Education for Employment”, stressing that there are 2.5 million university students need to acquire the basic skills the Job market requires. 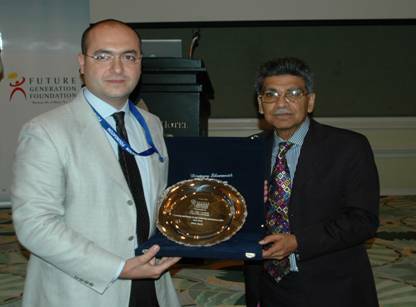 Furthermore Dr. Helal announced that his personal assistant is a BBSA Graduate. The graduation ceremony included several success stories for a number of the program’s graduates, who talked about the outstanding learning experience they have been through when they attended The Foundation training sessions, which included language, computer & communication skills. Additionally the trainers presented the stages of the training process and a movie capturing the views of some business leaders about FGF graduates was also presented highlighting the Programs success in serving the Business Sector needs. As a step to know a day’s economic crisis; the Foundation in cooperation with Dale Carnegie Training® Egypt organized a breakfast event on Thursday, March 19th, 2009 hosting key note speaker Mr. Peter Handal - Chairman of the Board, President & CEO Dale Carnegie & Associates, Inc. delivered a special session on “HOW TO LEAD IN TIMES OF ECONOMIC CRISIS”. 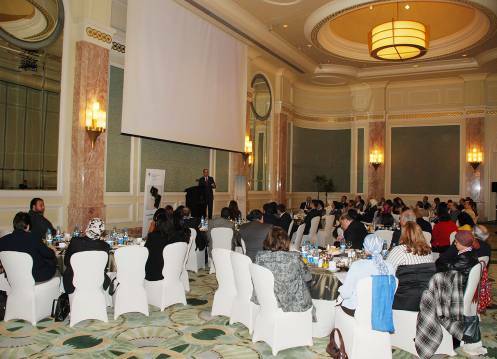 The event took place in the four seasons Hotel, and more than 100 HR and Training professionals attended the session in addition to Senior and Top graduates of the Center for Executive Excellence (CEE). 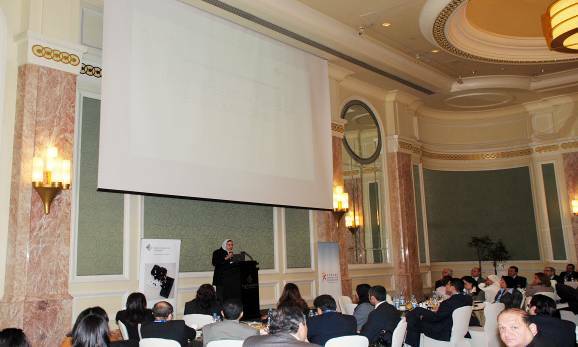 The opening remarks were given by Ms. Heba Shafei, HR & Admin Manager – Shell Marketing Egypt. Ms. Shafei, who is also a member of the Foundation HR Steering Committee, commenced by introducing the committee mission, vision and objective and welcomed new ideas from all the HR & training professionals during the event. 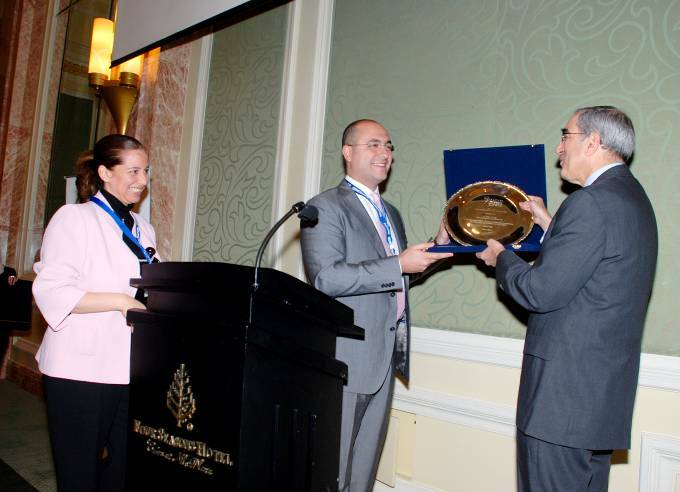 Ms. Shafei introduced the distinguished guest speaker Mr. Peter Handal and the important topic he would tackle. 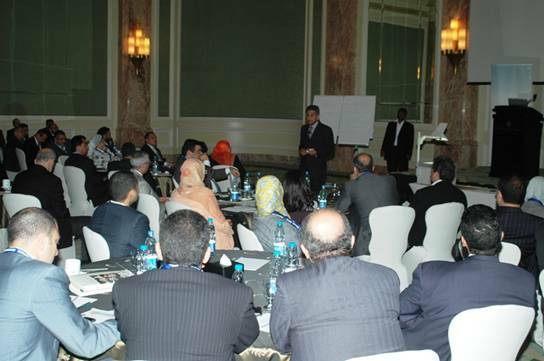 The floor was opened for questions following the presentation whereby participants were eager to discuss the challenges that the companies face today in Egypt amidst the economic crisis. 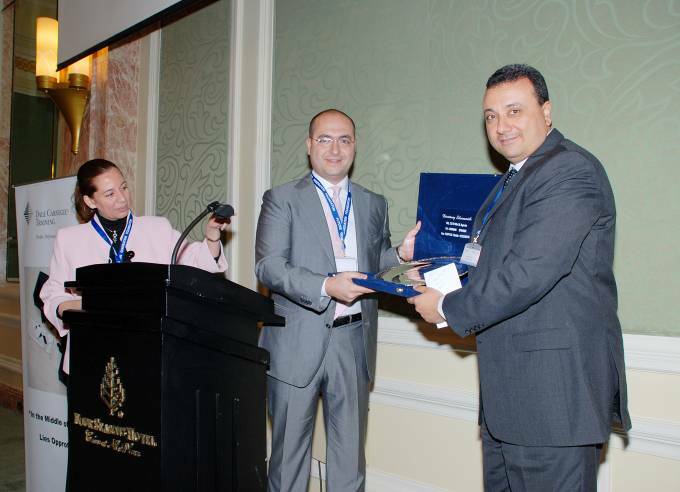 Closing remarks were deliberated by Mr. Tamer Badrawi –the Foundation Executive Director and Mr. Ahmed Al Daly – CEO Dale Carnegie Egypt. 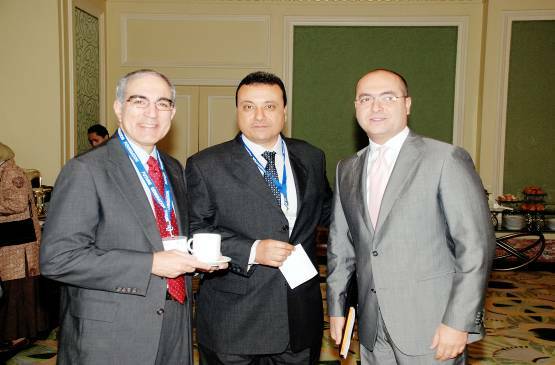 Mr. Peter Handal - Chairman of the Board, President & CEO Dale Carnegie & Associates, Inc.
From the Right; Mr. Tamer Badrawi – the Foundation Executive Director, Mr. Ahmed Al Daly – CEO Dale Carnegie Egypt. Mr. Peter Handal - Chairman of the Board, President & CEO Dale Carnegie & Associates, Inc.